Oliver & Company gets a bad rap. Released in 1988, it comes at the end of Disney’s slump, following the difficult The Black Cauldron and the forgettable The Great Mouse Detective, and just before The Little Mermaid – the recognised start of the Disney renaissance. But the problem isn’t that it’s a substandard film or an embarrassment to Disney, nor a huge departure from the established filmmaking process. It’s that Oliver and Company is just decent, which for a major studio like Disney is just adequate. There’s a lot to like here and a lot that is strong and well-constructed, but the problem is that the scale is too small and it pales beside other Disney stories that are epic in their scope and the original. 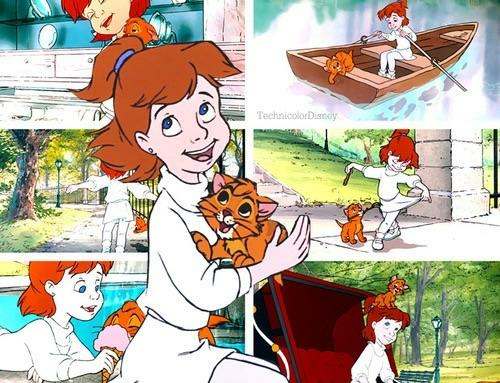 Oliver & Company is Oliver Twist with animals – and in New York. Oliver is a cute kitten while the Dodger and the rest of Fagin’s gang are dogs. Fagin himself is human, and perhaps the ugliest of all Disney’s major characters, while Bill Sykes here becomes a merciless extortionist. Instead of Mr. Brownlow, Oliver is taken in by a very cute little girl named Jenny Foxworth, who made me realise that most of Disney’s supposedly cute little girls are actually rather fussy and annoying. Jenny may be the cutest of Disney’s young girl characters. What Oliver & Company does well is its characters. Oliver is very cute and Dodger, while he could have been developed more, was convincingly compassionate. The rest of the gang is made up of tokens from stock, but they’re above average stock characters. There’s a British bulldog who loves Shakespeare, a big but dim-witted Great Dane, and a random female dog sadly given very little personality. Cheech Marin steals the show as hyperactive Chihuahua Tito, before his more threatening role in The Lion King a few years later. Then there’s Bette Midler giving an absolutely pitch-perfect performance as a spoilt, self-centred poodle who alone makes the film worth watching. I’ll never forget the way she ‘barks’. Fagin himself is a bumbling Dom DeLuise character very like the various crows and cats he plays in Don Bluth animated features, and while his final shows of compassion are nice, more could have been made of him. The problem here is that in making it the story of one cat who gets mixed up with a petty criminal, one rich girl and one nasty criminal, the scale stays very small. Other Disney movies are about the fate of kingdoms or preventing the wholesale slaughter of puppies. Here, well, there’s a lot of peril for our little gang and surprisingly there is also some pretty violent death, but it feels like the worst that would have happened otherwise would be a little girl got ransomed. Thus, Oliver & Company just falls short. Even in the Dickens story the stakes are much higher, be it inheritance theft, boys being shot, likeable criminals getting hung, prostitutes wanting to escape abusive relationships or serious comments on social inequality. This adaptation keeps things very light, and the price paid is becoming forgettable. But it is a bit sad the film is virtually erased from Disney’s merchandising or theming efforts. The songs are also dated and would have done better with jazzy instrumentation, the synthesised drums anything but timeless. But this is not to say the movie is bad at all. It’s well worth seeing and the animals are cute. There are some very funny character moments and the animation, while never stunning, is nice and smooth with some interesting and well-integrated early use of CG. But the fact is that some kind of fantasy setting or a feeling of much higher stakes would have made the film much more engaging and memorable.